Works like a home pregnancy test kit and reacts specifically to antibodies associated with the pathogen Melissococcus plutonius which causes EFB in honeybees. The kit performs as well as standard EFB laboratory tests. It has been validated by the National Bee Unit of the Food and Environment Research Agency (FERA), York and at other institutes internationally. It has been developed for Vita by the Foresite Diagnostics section at FERA in York, UK. 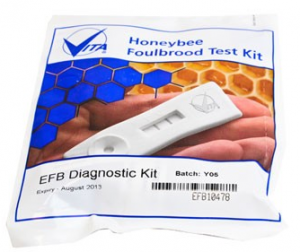 The EFB test kit is similar to and complements the AFB Diagnostic Test Kit (which tests for Paenibacillus larvae subsp. larvae, which causes AFB in honeybees). Extract a larva showing suspicious symptoms with the spatula. You can sample several larvae if needed, BUT don’t put too much organic material in the sample bottle – it may clog the device. Only tiny tiny samples are needed. Unscrew lid from the Extraction Bottle. Use the spatula to deposit sample in the bottle. Replace the lid and shake vigorously for about 20 seconds. BEWARE – the bottle contains buffer and sodium azide. Remove a Test Device from foil pack. WARNING Do not touch viewing window. Unscrew lid of Extraction Bottle and use the supplied pipette to remove a sample from the bottle. For best results remove the sample immediately after shaking to prevent bacteria from settling out of suspension. Hold the Test Device horizontally and gently squeeze two drops onto the sample well of the device. Keep device horizontal until extract is absorbed (c 30 seconds) and a blue dye appears in the viewing window. Whole or part samples can be used, but it is recommended that a whole infected larva be used to obtain the best results. A positive result (two lines show up – both Test and Control, see below) indicates that the target pathogen is present in the test sample, that is that the cell sampled contained infection by European Foulbrood. A negative result (Control line shows up only, no Test line) indicates that the EFB pathogen has not been detected in the test sample. There is space on the label on the reverse of the device to write details such as sample identification, date and result. Also on the reverse is a batch number for each device. If problems are encountered with any device please quote this batch number when contacting Vita (Europe) Limited. Please dispose of your test carefully and help to keep the countryside tidy. Which is correct – above, below or both? Two blue lines (C&T) indicates a positive result, test performed OK.
One blue line (C only) indicates a negative result, test performed OK. Faint blue T line, strong C line indicates a possible positive, test performed O.K. Brown C or T lines indicates the test has failed. If the test has failed we recommend carrying out another test using a new sample from the same original comb with a new device. Should problems persist please contact us. Note: As with all diagnostic testing a negative reaction does not necessarily indicate that the target pathogen is absent. A faint or absent line may indicate a low concentration of the pathogen or recent infection. If in doubt, repeat with a new device using a fresh sample or repeat in a few days time. Kits can be used only once and are disposable. The foil pack should be kept unopened and stored at room temperature (c18-25°C) until required. The devices must be kept dry at all times. Once the foil pack is opened the shelf life of the devices is not guaranteed, so it should be used as soon as possible after opening. The window of the test device should not be touched. If the device appears damaged, scratched, or marked in any way please contact us. Read all instructions before using test kits. CAUTION: This kit contains sodium azide in the extraction buffer, which is toxic. Handle carefully and avoid ingestion and contact with the skin. Sodium azide may form explosive copper or lead azides in plumbing systems. Always dispose of material containing azide by flushing copiously with water. Sample not mixed Inefficient extraction due to sample too large or too small. Try fresh sample or shake more vigorously. No blue dye flow Add an additional drop, one at a time until flow is achieved. No control line visible Too much sample added; test flooded. Repeat with new device and add only two or three drops. Flow components exposed to wet or damp. Repeat with new device. Brown lines (not blue) visible Brown lines are produced from concentrated sample, and not specific pathogen recognition. Repeat with a new, smaller sample. Faint lines Low pathogen concentration low concentration in sample due to sample size too small or sample not shaken long enough or vigorously enough. Damaged Devices/Bottles Please contact Vita directly. Please quote batch number for reference. Lines disappear after a few hours Degradative enzymes in sample have damaged the antibodies. Read tests up until 30 minutes only, do not read any later. See also Vita’s American Foul brood (AFB) diagnostic test kit.